At an April 1 press conference, held on the steps of the Inyo County Courthouse in Independence, stakeholders called on the Inyo County Board of Supervisors to protect the Owens Valley from large-scale, industrial renewable energy development. 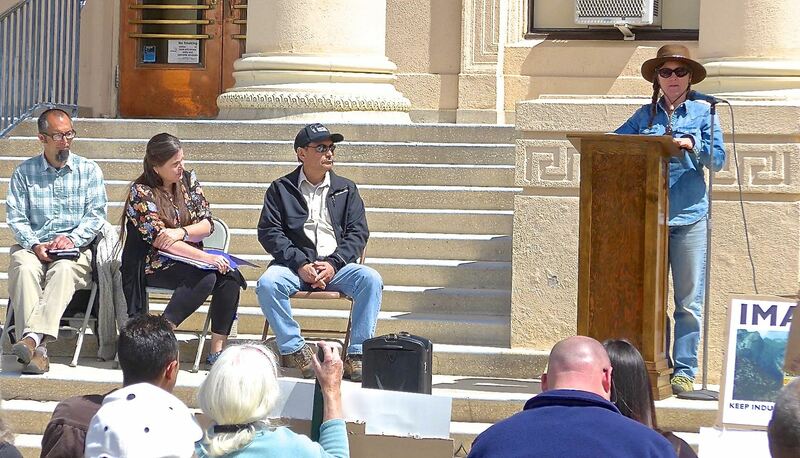 From left: Alan Bacock, Big Pine Paiute Tribe of the Owens Valley; Mary Roper, president, Owens Valley Committee; Bruce Embrey, co-chair, Manzanar Committee; Meredith Hackleman, Los Angeles community/environmental activist. INDEPENDENCE — On April 4, a broad array of groups working to protect the Owens Valley and the Manzanar National Historic Site from being devastated by large-scale renewable energy development urged caution and continued vigilance in spite of actions by the Inyo County Board of Supervisors and Planning Department that appeared to remove the Owens Valley from consideration as an area where such development would be allowed. At a meeting of the Board of Supervisors on April 1, Planning Department staff presented a revised Renewable Energy General Plan Amendment (REGPA) proposal that did not include the Owens Valley as a Renewable Energy Development Area (REDA). However, many individuals and organizations, including the Big Pine Paiute Tribe of the Owens Valley, the Manzanar Committee, and the Owens Valley Committee, warned that the Owens Valley REDA is still very much under consideration. Manzanar Committee Co-Chair Bruce Embrey noted that the Board of Supervisors took public input into account, but he also indicated that the fight against large-scale renewable energy development in the Owens Valley, especially within the viewshed of the Manzanar National Historic Site, must continue. “The Inyo County Planning Department suggested some criteria to add to the REGPA to determine whether a solar project should be built, including mitigating impacts to the culture and economy, and to avoid significant alterations to the viewshed of Owens Valley,” he said. “These are important considerations. But while the Manzanar Committee appreciates the Board of Supervisors taking our concerns seriously, no firm decision was made. The LADWP’s Southern Owens Valley Solar Ranch remains on the drawing board as well as the negotiating table. The public is urged to closely follow the actions of the Inyo County Board of Supervisors and Planning Department in the weeks and months ahead. “It is important to note that the activities conducted on April 1 showed that county staff and the Board of Supervisors are listening and responding to the concerns of the public, but this is not the end of the discussion,” Bacock warned. “Inyo County is still in preliminary evaluations of the REGPA and no decision has been made to actually choose any of the alternatives which have been presented. The ‘Less, Less Intensive’ alternative is a good step forward, but there are still questions which remain.